Having been banned by Apple, Spotify, Facebook, and YouTube — and having a significant amount of his content removed on Pinterest, of all places — it’s worth noting that Alex Jones and Infowars are both very much alive, at least on Twitter. Facing tremendous pressure from the loss of a bulk of his distribution network, Jones also has to contend with multiple simultaneous lawsuits accusing the Austin, Texas-based conspiracy theorist of defamation. The lawsuits primarily stem from comments made following a tragic school shooting at Sandy Hook Elementary, in which 20-year-old Adam Lanza opened fire, killing 20 six and seven-year-olds, and six adults. Sandy Hook is a synthetic completely fake with actors, in my view, manufactured. I couldn’t believe it at first. I knew they had actors there, clearly, but I thought they killed some real kids. And it just shows how bold they are, that they clearly used actors. I mean they even ended up using photos of kids killed in mass shootings here in a fake mass shooting in Turkey — so yeah, or Pakistan. The sky is now the limit. But this doesn’t matter. In months, perhaps years, Jones will face judgement for his crimes. Whether by judges in court rooms who hand down multi-million dollar settlements to the families of dead kids that he has defamed, or by the audience he has, for years, convinced that he was the sole voice of truth in an otherwise biased media landscape. Try as he might, Jones can’t have it both ways. He’s either the voice of truth he claims to be — in which case he should be held liable for his defamatory statements like any other media source would be — or he’s a performance artist who profits from the spread of misinformation, as he’s attempting to convince the courts. As we’ve said previously, Jones’ reckoning is coming. This is inevitable, so long as the judgement of his listener’s is as infallible as they’d have us believe. His attorneys don’t seem so convinced, stating “no reasonable reader or listener” would expect that Jones spoke factually on his show. So, maybe it’s a moot point. But that still leaves Twitter. 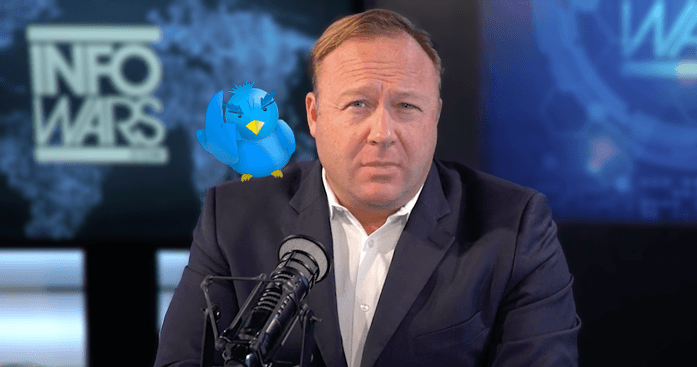 According to a source familiar with the matter, Twitter has no intention to block either Jones or Infowars, as neither has violated the platform’s rules. It’s worth noting, though, that this closely mirrors Facebook‘s sentiment on the issue two weeks ago, a decision the company has recently reversed, deleting Jones’ account earlier today. For Twitter, it’s entitled to do what it wants with its own audience. But the assessment that Jones has yet to break any rules is absurd. There’s a fine line between saying something offensive on Twitter, and linking to statements he’s said elsewhere, statements that would no doubt be an affront to Jack Dorsey and Twitter‘s sensibilities if either were able to take a broad view of their own rules. It’s a fine line, and one that Jones often crosses without repercussion.